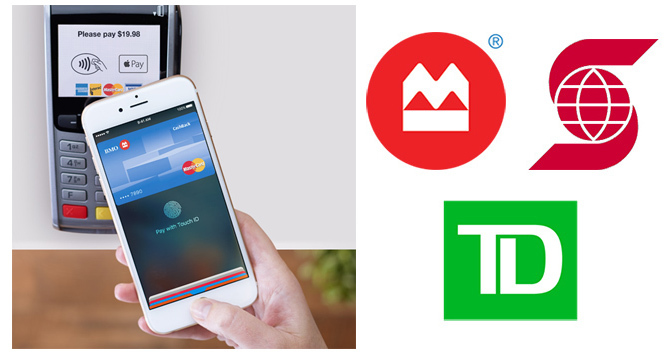 BMO, Scotiabank, and TD Canada Trust, which make up three of the five largest banks in Canada, support Apple Pay starting today. Apple Pay currently works with MasterCard and Interac at BMO, Visa and Interac at TD Canada Trust, and Visa, American Express, and Interac at Scotiabank. Eligible cards can be scanned or added manually to Apple Pay by tapping the "Add Credit or Debit Card" option in the Wallet app on iOS 8.1 or later. All three banks are now listed as participating issuers on the Apple Pay website in Canada since May. Meanwhile, ATB Financial and Canadian Tire Bank have added support for in-app purchases with Apple Pay on compatible iPhone and iPad models, expanding upon their existing support for in-store payments. Apple Pay is now available at all of Canada's "Big Five" banks, which collectively cover more than 90 percent of Canadian banking customers, after CIBC and RBC began supporting the iPhone-based mobile payments service three weeks ago. The banks serve over 50 million customers combined worldwide. Scotiabank direct banking subsidiary Tangerine will also support Apple Pay in the near future, according to its Twitter account. The next largest Canadian banks and credit unions that would be suitable Apple Pay candidates in the future include Desjardins and National Bank of Canada, the two largest financial institutions in Québec, along with Vancity and Meridian. None have been listed as "coming soon" on the Apple Canada website. Apple Pay can be used virtually anywhere contactless payments are already accepted in Canada, including at Apple Stores, Canadian Tire, Chapters, Coles, Indigo, London Drugs, Mark's, McDonald's, On The Go, Petro-Canada, Pizza Hut, Staples, Tim Hortons, and hundreds of other merchants nationwide. Apple Pay support is also coming soon to Air Canada, Aldo, Domino's, Pizza Pizza, Zulily, and the TTC transit system in Toronto. Additionally, the payments service can be used in apps such as Apple, Delta, Etsy, Fancy, Groupon, Kickstarter, Priceline, Starbucks, Ticketmaster, Uber, and Zara starting in June. Apple Pay is compatible with iPhone 6s, iPhone 6s Plus, iPhone 6, iPhone 6 Plus, and iPhone SE, in addition to the Apple Watch when paired with an iPhone 5 or later, for in-store payments, while the iPad Pro, iPad Air 2, iPad mini 4, and iPad mini 3 support Apple Pay for in-app purchases only. Apple Pay has been available for non-bank-issued American Express cardholders in Canada since last November. Apple Pay launched in the U.S. in October 2014 and expanded to the U.K. in July 2015. The service is also available in Australia, China, and Singapore. Apple is "working rapidly" to expand Apple Pay to additional regions, including Hong Kong and Spain and possibly France, Brazil, Japan, and elsewhere in Asia and Europe.